Given that I’m producing content for a website that’s all about basketball games, I do buy all the new releases every year on at least one platform; when it comes to NBA 2K, I currently double-dip on PC and PlayStation 4. Needless to say, I want to enjoy the games for myself, not just create content for and about them. After all, I believe that the content we create should be driven by our experiences with, and enthusiasm for, the basketball games we play (and not vice versa). The more games we have in our collection, though, the tougher it is to set aside time to sink a lot of hours into all the modes in order to get the most out of the experiences that they have to offer. Admittedly, the games have sometimes made the decision for me. When I’ve liked one game more than the other, or the quality has made the choice obvious by default, it’s been easier to ration my gaming time on the virtual hardwood. Whenever NBA Live has taken a year off in the past decade, the lack of choice has also simplified matters. It also afforded me an opportunity to get used to certain aspects of NBA 2K’s gameplay, and come to really enjoy the series. However, as NBA Live has continued to improve and offer an appealing experience, I find myself wanting to juggle the two games in order to get the most enjoyment out of both of them in the space of a year. Again, this is ultimately a desirable situation. Having two viable options in terms of sim-oriented basketball games is preferable to only having one. I would prefer that the quality of both games present this problem, rather than facing the prospect of having a single unappealing title year after year, or two titles where one isn’t a desirable choice. Even though NBA Live still has a ways to go, it does offer modes that I’d like to play, and I absolutely have interest in NBA 2K’s experiences as well. While I do have some gripes, I like the gameplay in both games this year. Add NBA 2K Playgrounds 2 and Basketball Classics to the mix, and the juggling act gets even harder. 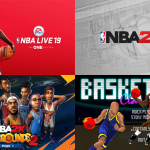 With NBA Live 19 and NBA 2K19, it helps that each game has a different approach to particular modes and concepts, and to some extent, that NBA Live is still catching up in terms of depth. 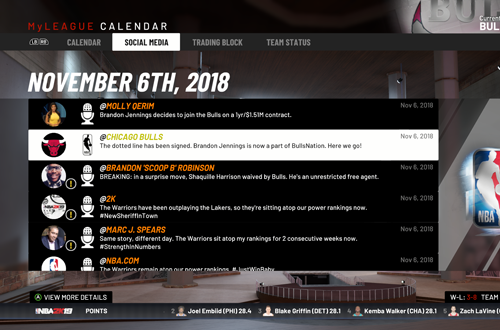 Franchise still leaves something to be desired in NBA Live 19, but I’m looking forward to playing a Start Today MyLEAGUE with the Chicago Bulls in NBA 2K19. I’m still undecided when it comes to the card collecting modes, though my hauls from the Locker Codes have me leaning towards MyTEAM. I did want to take a break from the career modes, but MyCAREER is a necessity to build a player for online play. Court Battles are quite fun too, as are LIVE Events and LIVE Run. NBA 2K Playgrounds 2 and Basketball Classics obviously offer a change of pace. I’m keen to see what Josh and Dave do with the latter once it’s out of Steam Early Access, as it’s already a fun game. 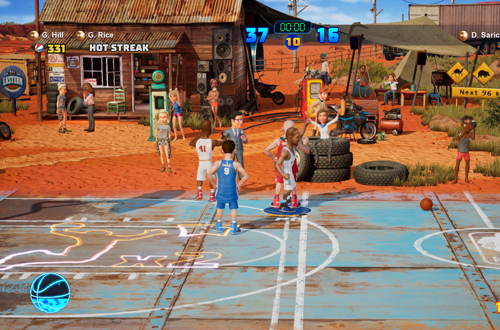 Playgrounds 2 – while still falling short of my expectations and the standard set by the best NBA Jam and NBA Street games – is quite solid and enjoyable, with more robust single player content compared to the first release. 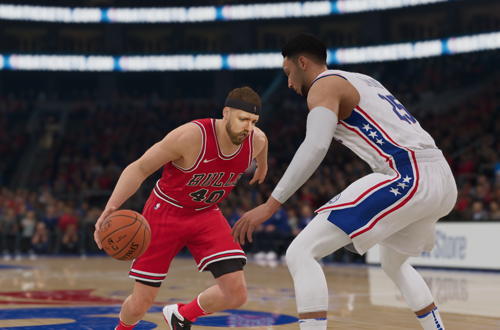 Both offer quick games and an opportunity to make more rapid progress compared to the sim titles, allowing them to be slotted in between sessions of MyLEAGUE, The One, MyCAREER, Ultimate Team, MyTEAM, and any of the connected online modes. Of course, even if I know what I want to play, I still have to pick and choose when I fire up each game. With four current basketball games that I’m interested in playing, as well as an interest in retro gaming (also a necessity for producing my Wayback Wednesday content) and a return to modding, I’m wondering if I need to set up some kind of a schedule: NBA Live 19 on this day, NBA 2K19 on that day, and the other games here and there in between. That way I can make steady progress through my new MyLEAGUE game, as well as continue to grind up my MyPLAYER and The One Player so that I can be more competent and competitive online. On the other hand, sometimes it’s more feasible (and enjoyable) to binge on one game at a time, and then switch to the other when you start to get a little bored or burned out. That’s what I did with NBA Live 18 and NBA 2K18; as it became obvious that I wasn’t enjoying the latter as much as I’d enjoyed NBA 2K17, I put it aside and spent time with the former instead. I just wasn’t feeling NBA 2K18, and NBA Live 18 felt like a much fresher experience, so it was the logical decision. It may be tougher to take a similar approach this year given that I do generally feel positive about both sim basketball games and my experiences with them so far, but it remains an option. It’s always a conundrum when a couple of video games that you’re really interested in are out around the same time, but it’s a more difficult juggling act when they’re games from the same genre. The overlap in modes and concepts, as well as the need to level up our player avatars in modern basketball games, can end up feeling repetitive. I do understand why many gamers prefer to only buy one sim and one arcade basketball game, or stick to just one hoops title per year. With my habits as both a collector and content creator, I do feel compelled to spend ample time with all the basketball games that I buy every year, in order to feel as though I’ve received my money’s worth. If you find yourself in the same situation, I’d suggest that we look on the bright side. It is a good problem to have, as fans of other sports games aren’t as spoiled for choice as we are. Choose the mode in each game that appeals to you the most, and wherever possible, aim for differing experiences: different approaches; different player builds, different teams, different strategies, you name it! Make peace with simulating when you need to, and switch titles when you’re getting bored. Juggling multiple basketball games and feeling like you’re getting the most out of each of them can be difficult, but it’s also an opportunity to have even more fun on the virtual hardwood.